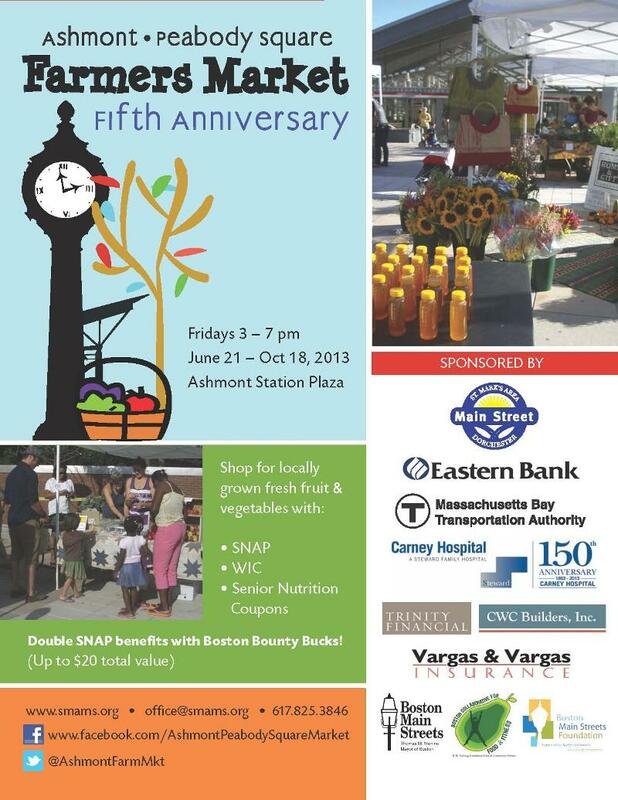 Join the Department of Transitional Assistance (DTA), Carney Hospital, and SMAMS at the Ashmont/Peabody Square Farmers’ Market at 2:30pm, Oct. 4 for an event that will be both delicious and economical! We’ll demonstrate how food purchased with SNAP and Boston Bounty Bucks at the farmers’ market can be used to prepare affordable, tasty, and healthy meals. Cedar Grove Gardens will be doing container gardening demonstrations, Red’s Best Seafood will show us how to fillet a whole fish, and Chris Douglass’s team will teach us how to use the bounty of produce from the farmers’ market (and give out some free food samples)! John Polanowicz, Secretary of Health & Human Services, Stacey Monahan, Commissioner of DTA, and other officials will join residents and local businesses (and you!) at the event.